The finished size is 53" X 73". Slightly larger than traditional baby quilt, this quilt is good for a toddler's bed. More blocks mean more opportunity to display motifs. Based on a traditional Irish Chain pattern but simplified to be much faster and easier to make. The finished size is 48 inches square. 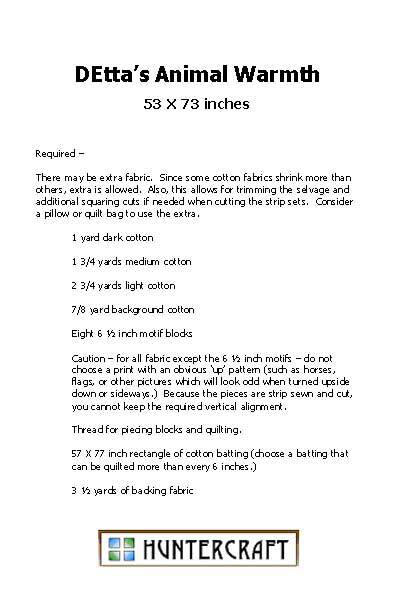 This is a perfect quilt for beginners as there are very specific cutting, stitching, and pressing directions. Based on a traditional Irish Chain pattern but simplified to be much faster and easier to make. It makes up very quickly, which is perfect for a last minute baby gift. It can be used with motif fabrics or theme fabrics for a baby, motif fabric for a kitchen accent, or to showcase redwork or photos as a wall hanging. See examples of DEtta's Irish Baby on my Portfolio page. The individual patterns are normally sold at my lectures. Please contact me if you'd like to purchase a pattern and have me mail it to you. At this time, I'm not taking orders via the web, but email or call me and we can discuss a convenient method for payment and shipping. These are great patterns for shops to use for kitting or classes with thier in-stock motif fabrics. Please contact me to discuss wholesale pricing. If you have a specific motif pattern to use, and interested carrying the pattern, I can adapt the a pattern for your shop.